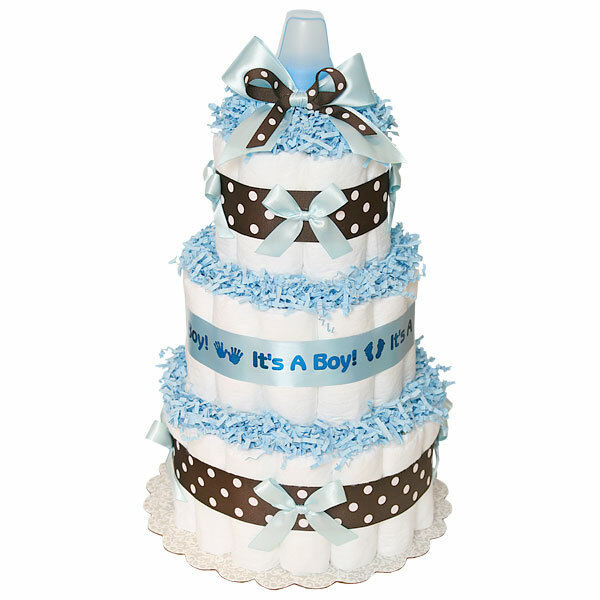 A fantastic and practical gift for any new mom, three-tiers blue and chocolate diaper cake "it's a boy". Very clean and simple, classic design. This cake consists of 50-55 rolled Pampers Swaddlers diapers size 1 (7-14 lbs.) and one baby bottle, wrapped with a really fun polka dot ribbon, and a blue ribbon that says "it's a boy". Decorated with blue bows and crinkle paper. This cake sits on a 10" corrugated cake board, 15" in height. Comes wrapped in cellophane with coordinating ribbons and bows. All our diaper cakes made of highest quality ingredients with greatest care and love. Everything included is ready to use and easy to disassemble.